Some nights there is nothing better than breakfast for supper. Especially when you have an easy flavourful dish that takes simple baked eggs to the next level of deliciousness. I found this recipe on sweetsugarbean and knew immediately I would be making it. Please do stop by Renee’s site and check out all her fabulous recipes. The only changes I made were to use mozzarella. I would have used Regiannio Parmigiano but I have been putting off my trip to Costco. This would be amazing with it and can not wait to try the version. I used chopped green onion in place of the chives. And added the pepper before I placed the cheese on the egg. 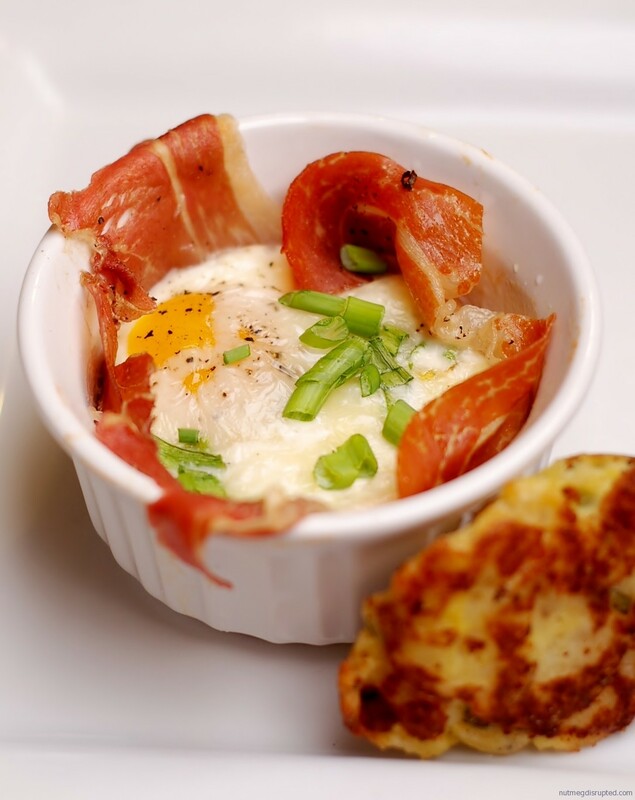 Line 2 ramekins with prosciutto. I had 2 1/2 slices in each. Crack an egg in each ramekin. Drizzle 1 tbsp cream in each. Top with cheese and cracked pepper. Bake in the centre of a preheated 375*F oven, for about 10-15 minutes, depending on how well done you like your eggs. Sprinkle the chives. The proscuitto gives it just the right amount of saltiness. The addition of the cream mixed with the mozzerella gave the eggs a fantastic creaminess. To have eggs that are a touch runnier start checking them around the 8 -9 minute mark.